The Tennyson is the top bed in the Bedmaster range and incorporates a lot of new ingredients not only the airstream bonded wool but new fabrics that offer better breathing and greater reduction against allergies. The Tennyson mattress uses a special fabric that uses oceanic micro particles that aid skin care and with its botanical origins it ensures good breathing properties which help the mattress stay fresh, allergy free, reduces skin loss and prevents the occurrence of bad odours. 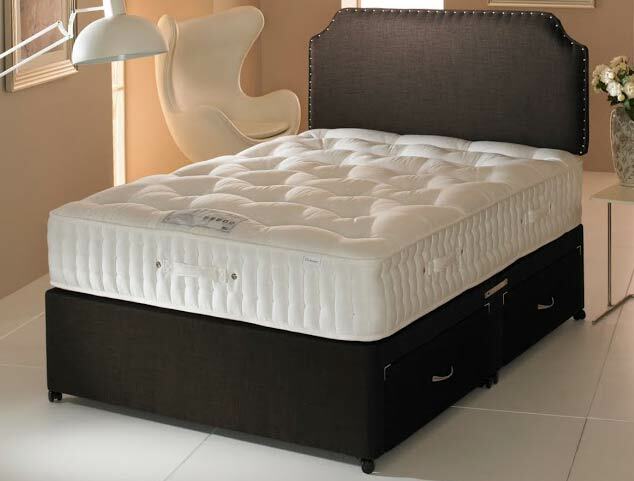 The mattress also benefits from 4000 pocket springs in a king size mattress split between 2 layers and padded with lambswool, cotton mix and an indigo binder fabric that helps offer excellent pressure relief. The mattress sits on a platform top hard base which comes as standard as a non drawer in a range of over 20 fabric colourways , drawers are available as a upgrade with a choice of 2 or 4 drawers and a matching madrid headboard can be added for a small additional price , and all this can be delivered to your room of choice in 2-5 days to most mainland post codes.